Astronomers have used light echoes from a supernova explosion as a time machine to look again at a historic stellar event first witnessed on Earth more than 400 years ago. The brilliant 'new star' appeared in the sky in 1572 and was so bright it could be seen during the day. It was observed and charted by astronomer Tycho Brahe who discovered it was far away from the moon. 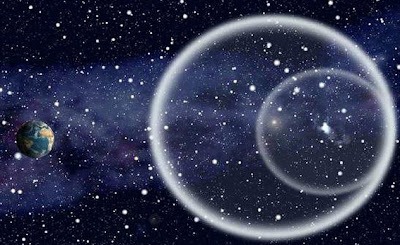 This overturned 2,000 years of scientific thinking based on Aristotle's theory that placed the Earth in the centre of concentric sphere, in which stars were fixed. Although Tycho didn't realise it, he was not seeing a new star but rather a supernova - a violent explosion in which massive stars end their lives. Now scientists from the Max Planck Institute have been able to re-examine the groundbreaking event and classify the supernova. 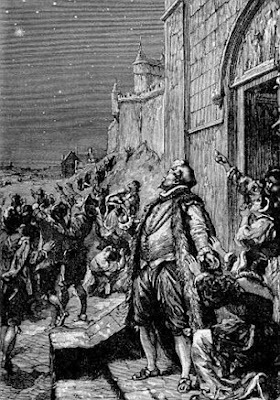 Although the original light or 'direct photons' from the explosion passed by Earth in 1572, telescopes in Hawaii and Spain have captured faint light echoes of the original explosion, which were reflected off a galactic cloud of dust. 'Think of a rock dropping into a pond,' said a spokesman from the Calar Alto observatory in Spain. 'The waves go out uniformly until they hit something like a pier, then new waves are generated, which also travel outward. 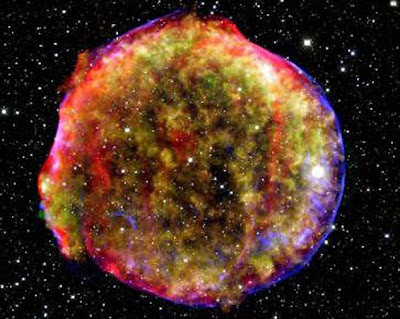 Historical records suggest Supernova SN 1572 or Tycho's supernova is a type Ia supernova - the thermanuclear death throe of a white dwarf star and new evidence from the study supports this. Type Ia supernovas are the main source of heavy elements such as hydrogen and helium. Elements critical to life such as carbon and oxygen would not exist on Earth without these explosions. 'We find that it belongs to the majority class of normal type Ia supernovae,' said team leader Dr Oliver Krause. The questions or how and why the white dwarfs explode is unexplained and the team plan to use their new data to test current theories. In one model, a white dwarf star gains new material from a companion star until it reaches a critical mass and undergoes an explosion. Another theory is that the accumulation of mass occurs by the merging of two white dwarfs. 'An exciting opportunity now would be to use other (light echoes) to construct a three-dimensional spectroscopic view of the explosion,' Dr Krause said. This could shed light on star-formation history as well as the chemical evolution of our local galaxies.